How Does Skimlinks Affiliate Network Work? VigLink Verdict – Should You Join? Skimlinks Vs VigLink – Which Is Better? 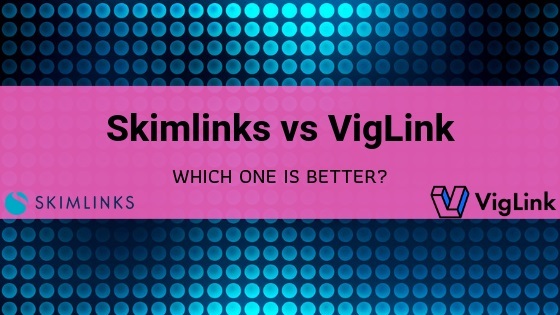 Skimlinks vs Viglink: which one is better? Let’s find out in this super detailed review! If you’re an affiliate marketer you know how difficult it is to get accepted to credible affiliate networks. Every internet marketer will tell you there are thousands of products to promote, but the reality is most affiliate networks or affiliate programs don’t really approve new members instantly and it’s hard to keep track of all the affiliate programs if you’re promoting multiple products. Affiliate networks ensure that they only approve trustworthy people to promote their merchant’s products and services. In a nutshell what we’re saying is that even though there are endless options when it comes to promoting affiliate products it’s not easy to get approved. First you have to sign up with affiliate networks which require screening of your website and also you have to request permission from individual merchants to approve you promote their products. The bad news is that most of the time they don’t approve new applicants without any sales record or brand new websites. Some merchants will not approve you even if you met their criteria because you’re not from the list of selected countries allowed to promote their products. We’ve come across a lot of merchants that only accept affiliates from the United States. If you’re the type that wants to get over these problems and want to start making money online quickly from your websites and blogs, you definitely want to consider using either Skimlinks or VigLink. VigLink and Skimlinks accept almost everyone when it comes to affiliate marketing. With these two services you don’t need worry about applying to merchants and waiting for weeks before getting approved. VigLink and Skimlinks have already partnered with thousands of merchants to make it easier for affiliates all over the world to start making money right away. Skimlinks has over 48,500 merchants and VigLink has over 12,500 merchants. So you can see you’ll never run out of options when it comes to choosing the right affiliate products to promote. Skimlinks and VigLink make affiliate marketers dream come true. You can sign up for these programs and you don’t need to worry about cloaking your affiliate links. You’ll never have to apply individually requesting for permissions to promote a product or a service. With Skimlinks or VigLink all you have to do is to place ordinary links on your blogs or websites and they’ll take care of the rest. Instead of promoting multiple programs from various affiliate networks and waiting for different checks to arrive at your bank account why not put all your money in one place! This is what Skimlinks and VigLink do for you, putting all your eggs in one basket. Not only that they can help you cut out some taxes since you’re not directly signing up from the merchants, this is beneficial especially to US citizens. So now that you’ve understood how Skimlinks and VigLink work it’s time to take a look at each of them separately and see what they have to offer to you as an affiliate. Skimlinks started back in 2006 from a website called Skimbit. Back then it was a social decision website. It’s so far one of the oldest affiliate networks that is available to affiliate marketers. It’s from this small social decision website the owners decided to increase their revenue through affiliate marketing and was later changed from Skimbit to Skimlinks. Up to this day Skimlinks is considered by many as the best affiliate program to join. It’s not just a program, they bring together the best merchants on their platform. These merchants will hardly approve you if you were to apply individually. Take a look at Commission Junction for example. The merchants will turn down a lot of applications but when you sign up with Skimlinks you’ll be automatically approved for such products. With over 48,500 merchants you’ll find different programs related to your websites. With Skimlinks you can track all your affiliate efforts. The analytic report in your dashboard is effective and accurate when it comes to tracking your affiliate links. So we can say that Skimlinks is the most powerful affiliate marketing tool you can ever have as an affiliate marketer. Merchants. These are the product vendors who own the products and services. They’re looking for advertisers to promote their offers. They’re the ones that pay Skimlinks commission and then Skimlinks will in turn pay it’s advertisers after deducting their own commission. Publishers. These are the advertisers that register to promote merchant’s products on their website. They receive a fixed commission designated to each product. The Network. This is the Skimlinks platform that brings together both the merchant and the publisher together in order to build a business. Customer. Then there is the customer who must come in before any revenue is generated. When a customer makes a purchase from Skimlinks affiliate links, they take their commission and give publisher’s their own share. So by now you should know that Skimlinks is just acting as the middle man between the merchant and the publisher. Instead of spending a lot of time searching for products to promote, Skimlinks simplify things for you as a publisher by bringing together over 48,500 merchants on their platform for you to promote. That’s really easy if you have a good website or a blog. Just head over to Skimlinks official website and fill all your personal and website information. Make sure to provide accurate data especially when it comes to your website traffic statistics because they’ll verify it. After submitting your application they’ll review it and then decide whether to approve you or not. They’ll check whether your website is receiving significant traffic from the US, Australia or Europe. Make sure a large portion of your website traffic is coming from these regions or else you’ll be rejected. Do you have unique content on your website? You want to make sure that you have valuable content on your website and should not be a duplicate content from other online sources even if it’s your own content or you have the right to distribute it. Is your website built for the sole purpose of promoting products? You should make sure that you have little to no product reviews on your website; Skimlinks don’t like affiliates with many affiliate links on their pages. Do you receive a lot of traffic? Apart from having traffic coming from the regions we’ve mentioned your website also must pass the minimum traffic volume quota. We don’t really know the minimum quota but if you’re receiving a considerable and consistent traffic for the past few months you’ll be approved. These are some of the few things you should consider before applying to Skimlinks. But one thing for sure is that if you have high quality content on your website you’ll definitely be approved. Don’t make the mistake of adding a new website during your application. You want to work on your website or blog for a few months before submitting your application. It will take at least two to three days before they get back to you with feedback. Once you’re approved you’re ready to start making money on your website and there is no need to apply separately for each merchant. And the best part is you don’t need to add affiliate links manually to each and every page on your website, Skimlinks will automatically add affiliate links based on the content of the page. This is pretty much like Adsense – they’ll insert an ad or hyperlink a word with a product that’s related to such word. Skimlinks has three major technologies that allow you to earn affiliate commissions 24/7. This is the name of the company but with this feature, all normal links on your website can be converted to affiliate links. Like I said earlier there’s no need to spend your precious time adding affiliate links manually on your pages. You need to specify the site URL you want to link and every time a visitor clicks it will be directed to a product that will earn you commission. Skimlinks technology will direct a user to affiliate offer and at the same time keep the original website URL. A visitor will not even realize that he is been directed to affiliate links. This is one of the features that make Skimlinks the best affiliate network to join. In order to benefit from this feature you have to install proprietary software on your website server. The software can be installed easily on all the major content management platforms you’re using such as wordpress. The next technology Skimlinks offer is the SkimWords. This feature allows Skimlinks to pick different words on your pages that match some of their products and then link back to such products. This is a time saver for someone that has thousands of pages and don’t have the time to make hyperlink text with affiliate links. Skimlinks will simplify the process for you using the SkimWords technology that’s available in your dashboard. The products will be presented in your chosen format; either banner or carousel and they’ll be displayed on your website. You can see there is no need to spend time searching for products to promote, everything will be done automatically. The only challenging part of Skimlinks is to get your application approved, and that that’s not difficult if you have a quality website. You should understand that when you join Skimlinks you’re automatically signed to all their merchants affiliate programs. The moment you join you’re approved to promote 60,000 products which are listed on their network. For any product that you’re promoting as an affiliate you want to make sure that you’re getting real time tracking of the offers you’re promoting. So far Skimlinks dashboard is one of the cleanest you’ll find in the marketplace and all this is due to the fact you’re not dealing with individual affiliate programs. Everything is presented to you in a way that’s easier to understand. The dashboard breaks down your activities for the past 30 days. You can see the number of clicks and sales generated. You’ll also be able to see which campaign generated the highest revenue for you, Skimlinks, SkimWords or Showcase. Once you see the performance of each you can focus on the one that brings in the most profit. You can view top earning merchants so that you can add more content on your website related to the merchant’s product. You can see offers that convert better and see the websites that are bringing in more revenue, that’s if you add more than one website to your account. The dashboard is a great platform for affiliates that want to view their stats every hour. Most affiliate marketers are junkies when it comes to stats. Skimlinks provide every bit of report so that you can improve your marketing efforts and campaigns. You’ll be able to view 6 analytics graphs from your performance tab so that you can have an idea of what’s going on. Daily Analytics Report. This gives you a breakdown of all your activities for the day or the selected time frame. This includes conversion rate, clicks, earnings, order value, and EPC. Merchant Analytics Report. This will show you affiliate merchants reports and stats. Site Analytic Report. This will display the performance of your websites and the ones that are generating more clicks and revenue. Unaffiliated Clicks Analytic Report. This is a report of links that aren’t associated with Skimlinks. This helps you to find links and pages that aren’t converted to affiliate links. Product Insight Report. This will show you the products your referrals buy from the merchants in your account. This info is important because it shows you how to promote future affiliate products. Page Insight Report. This will list down all the pages that have generated a sale from the affiliate merchants. Skimlinks Provide The Best Commissions. Other affiliate networks like Commission Junction pay affiliates less but with Skimlinks don’t be surprised to earn up to 110% commission from a single sale generated. Easier To Integrate. Skimlinks affiliate links are easier to integrate on your website. There is no need to manually add links, you just need a short code which you’ll copy and paste on your website and Skimlinks will take care of the rest. They’ll add relevant products to your pages and you’ll start earning money quickly. Affiliate Links Cannot Be Changed. The short code that will be installed on your website ensures that none of the affiliate links from Skimlinks are changed or whatsoever. You don’t to need to worry about finding and fixing broken affiliate links on your website. They Provide an Excellent Analytics Report. You can view your performance in order to ensure you’re making the most money out of your blog or website. You have access to different marketing tools to help you improve marketing efforts. Getting Accepted Isn’t Easy. Like it has been previously mentioned you have to take some time to optimize your website first before submitting your application at Skimlinks. You should have a website that’s at least one year old and you’re receiving lots of traffic from U.S, Europe and Australia. If you’re new to affiliate marketing business chances are that you won’t be accepted since you haven’t yet established yourself. Another downside of Skimlinks is that they pay only once a month, this might be ok for most affiliates but most affiliate networks pay twice a month, there are a few that pay even weekly. If you’re the type that wants to get paid fast then Skimlinks can be the wrong choice for you. Even though Skimlinks have merchants from different niches they mainly focus on these niches: lifestyle, automotive, fashion, consumer technology and electronics. These niches have more merchants, in other niches you might find just a few merchants. But with that said they have over 60,000 merchants. With these merchants you’ll hardly run out of options when it comes to picking offers to monetize on your blogs. Since Skimlinks act as an agent between you and the merchants they’ll deduct their own share and then give you the remaining commission which is offered by the merchants. Their commissions can be as high as 25%. If you have a website that’s receiving traffic and you don’t have the right offers to promote, Skimlinks is your perfect option to make extra money from your website with ease. Skimlinks is ideal for bloggers that cover different niches. You don’t need to spend endless hours searching for products to promote on every section of your website. Skimlinks take care of placing the right ads and links on the various pages and sections of your website. And my favorite option – Forums. If you operate a forum, you can monetize it with Skimlinks. Any links that have ever been published on the forum will get converted to affiliate links. If you own a medium sized forum you might be sitting on a pile of cash. You’re paid for commission on a net 30 days and basically, payment is made either through PayPal or bank deposits. If you reside in the US or UK you can be paid by both bank deposits and PayPal. If you’re from US you can also be paid by check. You need to make at least $10, £7 or €8 in order to be eligible for payment. Overall I can say that Skimlinks is worth trying because they have enough merchants from different categories that will help increase your website earning potential. It’s time to move to the second affiliate network that will help earn more from your website or blog. If for any reason you’ve been rejected at Skimlinks or you’re not satisfied with their services the next affiliate network you want to check out is VigLink. We’ll take a look at it too and see the features they have to offer to affiliates. Similar to Skimlinks but they also have distinctive features that set them apart. VigLink is an affiliate network that connects publishers (affiliates) and merchants (vendors). VigLink technology will scan through your website and add relevant links to your pages that will you earn commissions. VigLink ensures that all your website content is well monetized for money. They do this by scouring your website to find links and content that has the potential to earn you revenue using their merchant’s links. They’ll insert a link which will be directed to the appropriate page. This means you can continue to add as much content as you can without the need to spend countless hours adding affiliate links or the need to outsource to someone to do the task. VigLink if utilized properly will bring in consistent revenue for your website content. Merchants can benefit a lot because Skimlinks have more than 2 million websites in their network promoting merchant’s products and services. As a vendor you can save yourself a lot time without the need to launch your own independent affiliate program. You’re tapping into a marketing network that has the potential to promote your products to a large audience that’s not possible for you to reach. Just like Skimlinks everything is done on autopilot, you just need to install a code and they’ll automatically scan through your website and find links and phrases that can be monetized to bring in more revenue for your website. You just need to install the tracking code and VigLink takes care of the rest. You can specify the types of links you want users to be directed to using some parameters in your dashboard or you let VigLink take care of the entire process. For merchants when you join VigLink you’re not on one platform, they optimize all your links on different channels like social media and other publishing websites to help give more exposure to your business. They make things easier for merchants without the need to integrate their social media sites. The process is very easy, all you need is to have a good website and also ensure that you’re not promoting products from other networks. If you have already joined another affiliate network like Skimlinks which we previously talked about you shouldn’t add the same website to VigLink. To get started, click the sign-up button and then enter all your personal and website information accurately. Remember everything will be verified especially your site traffic stats and the sources of your website traffic. Once you’re approved you’ll be given a code that should be installed on your website. After installing the code VigLink will scan your website to find keywords that matched with their offers and then link back to them automatically. They’ll link the best possible programs that will give you the most revenue. All the vendors at VigLink will earn you commissions instantly without any manual work involved. Whatever platform you’re publishing your content on, you can use VigLink for affiliate monetization, you just need to install the code given to you. VigLink affiliate network is easier to use than promoting individual affiliate programs because you don’t need to bother whether your affiliate links have expired or not. Whenever a merchant don’t wish to promote their product with VigLink, they’ll automatically replace those links without the need for you to remove such links manually. VigLink adds endless products from Amazon and eBay such as books and accessories. The sky is the limit when it comes to monetizing your website with VigLink. Instead of running Google Adsense on your website earning a few cents for every click, VigLink will pay way better than Adsense. VigLink don’t pay by the click, the do pay per action (CPA), a sale or any form of action desired by the merchant must be performed such as submitting email address or phone number. VigLink is a good affiliate network for anyone that’s looking for simplicity without the need to handle multiple affiliate programs simultaneously. I will say that VigLink won’t do any miracles for you but one thing for sure is that if you’re willing to spend time and add content on your website you’ll earn a lot more commissions than you could earn with other affiliate networks out there. They also offer a referral program. If you’re interested in earning more, you’ll earn 35% of what VigLink has earned for the first year. If for instance someone signs up through your referral link and makes $100, then VigLink earns 25% which is $25, and as someone who referred them will earn 35% of that $25 earned by VigLink. The commission might not be attractive but if a publisher joins through your referral links and earns big commissions that’s where you can expect to earn a lot and that too for up to one year. So this means reoccurring income for you without making any extra effort from your promotions. There are four payment options to choose from depending on your country. The first option is PayPal which is available to all countries and then ACH which is available to only US residents. Check is also available to US residents only. The 4th option is Wire Transfer and is available to all countries. The minimum threshold for PayPal withdrawal is $10, and $50 for other payment methods. On most affiliate networks out there you have to earn a minimum of $100 like Adsense and Amazon, but VigLink requires only $10 to withdraw. VigLink won’t affect your SEO traffic. VigLink is a company with a good reputation. We all know that too many affiliate links on a website will affect website ranking (if they’re do-follow). But VigLink don’t really add those types of affiliate links, they direct their offers to the landing page without altering your links. This means your website URL will show but their landing page will be displayed. This is really a smart move from VigLink. VigLink is safe to use with Google search engine traffic without any worries. Time Saving. As we’ve mentioned earlier VigLink take all the work from you by automatically monetizing your website and blog pages at once, you really don’t need to add links manually and this is a great time saving money machine for your website. You Don’t Control The Affiliate Links. Since affiliate links aren’t added manually you can’t control the type of affiliate links VigLink can add and this means you should expect to see lower conversions because most of the time the offers linked might not be relevant and there isn’t any call to action that will persuade your site visitors to visit and purchase a product. But in order to benefit more from their service, you should write a review on some of the products that are available within their network and they’ll automatically add the relevant links to your reviews and this way your conversions will increase. You Need Massive Traffic In Order To Benefit With VigLink. You need to drive massive traffic to your website if you want to make more profit with VigLink. The offers added are just links to some of the words inside your content and most of the time people ignore it. Things have changed now when it comes to internet marketing, you have to command prospects to take action rather just adding a hyperlink in your content. Commissions Can Be Very Low. VigLink places a lot of Amazon and eBay affiliate links and we know that these programs pay very low commissions even when you’re joining their program directly. Amazon pays from 1% to 10% based on the product and VigLink will take a portion of that commission, and the bad side is that most Amazon products are cheap, especially, books that cost $5-$20. Imagine how little you could earn per product! Since you have an idea on how VigLink works it’s easier for you to decide whether they’re worth joining or not. VigLink is perfect for anyone who doesn’t want to go through all the complex process of joining multiple affiliate programs. VigLink is super easy to get started and get approved, installing their monetization code isn’t a big deal and you’ll be ready to start earning commissions. So far VigLink hasn’t received much complain from users regarding affiliate payments and there are a lot of case studies from webmasters who’re earning thousands of dollars every month with this giant affiliate network. So you don’t need to worry about your affiliate payments because you’ll get your hard earned money on time. Up to date VigLink is considered to be among the best legit affiliate programs to join and that’s because they have delivered excellent performance to both publishers and merchants. If your website is receiving a lot of traffic you can give VigLink a try. If you’re not happy with the earnings you can then move forward to choose another affiliate network that has what you’re looking for. Looking at their features we can say that Skimlinks offer more features and has more merchants than VigLink. But together they both work in a much similar way. They know the value of their publishers and are both reliable when it comes to payment. VigLink pay faster and have small minimum threshold just as we’ve mentioned previously and also VigLink might be easier to join since Skimlinks have a lot of requirements, for instance a large portion of your traffic must come from United States, Europe and Australia. But with that said a good way to choose between the two services is to look at the merchants available so that you can see what each is offering. If Skimlinks have more products that are related to your website you can join their program. Likewise if VigLink has products that are more targeted to your website content that should be your option. If you have multiple websites you can join the two affiliate networks, based on your experience you’ll be able to decide on which network to stick with. When it comes to choosing the right affiliate networks it all comes down to the one pays better, so joining the two networks will help you decide who pay better for your website traffic and monetization.